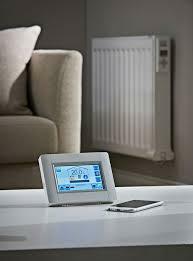 Cosyheats German radiator has a built in digital electronic room thermostat and 7 day programming system. Optionally they can be controlled remotely by radio frequency. The electronic thermostat is accurate to +/- 0.2 deg C and the timing system allows you to pre-set required room temperatures at specific times. As the temperature drops in a room the thermostat senses the change and switches the heater on, perhaps for only a minute to re-heat the internal plates. This continual dynamic re-heat process continues thereby maintaining the room temperature. The ability to sense temperature changes and react immediately is one of the great benefits of this type of heating. 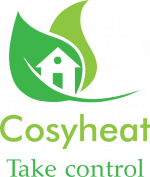 Because of the ability to heat up quickly and store heat, the use of electricity is limited and the cost of using the Cosyheat radiators can be just a few pence per hour. Recent tests in the UK have confirmed the low running costs. These tests have shown that not only do these German radiators heat the room to a comfortable even temperature but also keep the floor temperature within a few degrees of the ambient room temperature giving you complete control.